Apricot Lane franchise business opportunity. Free Apricot Lane business franchise information. 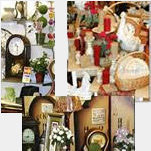 Apricot Lane specialty retail stores are part of a Country Visions retail franchise system that specializes in unique gifts, fashion accessories and home décor products. When you join the Country Visions franchise system, you will benefit from one of the most advanced operational systems in the nation. You will gain access to extensive networking resources. You will also be trained by our professional staff at our Country Visions University in visual merchandising, pricing strategies, customer service, marketing and computer systems, as well as employee motivation and development. Country Visions, the corporate support for Apricot Lane, works hand in hand with you throughout the process of creating your new store, from securing a location, negotiating your lease, ordering your merchandise to opening your doors. With our strong buying network, in-house advertising department, comprehensive training programs and ongoing support and guidance, we offer the perfect opportunity for you to be in business for yourself - not by yourself. Ken Petersen and Tom Brady opened the first Country Clutter store in August 1991 in Vacaville, California. Their unique store, built around traditional street themes and a cozy home environment, was a hit from the start. In less than one year, the Petersen-Brady partners established a second and third store, and began plans to franchise the Country Clutter concept. It was at this time that Scott Jacobs joined Ken and Tom as a third partner. As a result of their own hands-on experience, Ken, Tom and Scott have built the Country Visions franchise with a unique understanding of the tools necessary to run a successful business. In 2004 Country Visions added the Apricot Lane store concept to the franchise. Our Apricot Lane stores feature many of the same lines as Country Clutter, while offering the opportunity to carry more contemporary products and market to a broader range of consumers. Today, Country Visions, Inc. includes more than 60 franchised stores operating in 25 states across the country. Lead by Ken Petersen (CEO), Scott Jacobs (President), and Tom Brady (COO), Country Visions is dedicated to the strength of its brands and to the success of every franchisee. Voted #1 Gift Store Franchise in 2003, 2002, 2001, and 2000 by Entrepreneur Magazine! To learn more about the Apricot Lane Gift & Home Decor franchise opportunity, simply complete the form below.